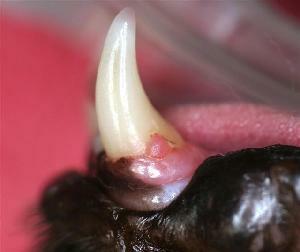 Feline tooth resorption is a common and painful condition in domestic cats. Studies have shown well over 50% of adult cats develop tooth resorption. The teeth become functionally destroyed as a result of tooth (dental) resorption. These lesions were originally called feline "neck lesions", "cervical line lesions" and cat "cavities" because the lesions were typically observed in the "neck" region of the tooth or cervical area (in the region of the sulcus). This is very close to the area where the tooth meets the gum line or the free gingival margin. Initially, it appears that the gingival tissue is growing into the tooth or is covering over the base of the tooth as shown in the photo below. In some cases, there appears to be a "hole in the tooth" (also shown in below photos). Some teeth undergoing tooth resorption are not clinically apparent until dental radiographs are taken (also shown below). Right upper canine tooth with tooth resorption. The gingiva is covering the resorbing area of the tooth. Dental radiographs are essential in evaluating teeth for resorption. Lower left canine tooth with early resorption. Right upper premolar region with tooth resorption. see right and left views. excessive salivation due to tooth resorption (see photo above). Notice the mesial (front) root appears to be resorbing in radiograph above. Note left rostral mandibulectomy. A fine tactile periodontal probe helps detect this premolar with tooth resorption (shown above). 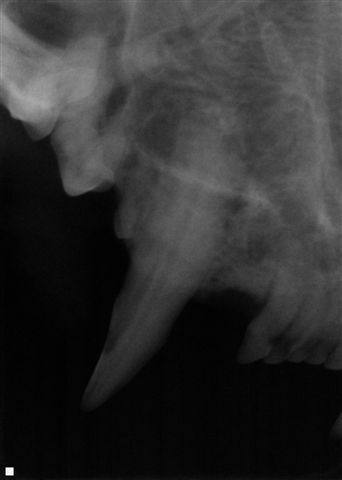 The radiograph of the left rostral mandibulectomy is of this same tooth (photo immediately above this photo). Left view, 2 years after bilateral mandibulectomy surgery. that these teeth are fragile and subject to fracture. Left mandible; tooth resorption may Right mandible; same cat. radiographs are needed for a diagnosis. (dark area of tooth crown). no tooth resorption. These lesions have been studied extensively at the University of Pensylvania. We know they are not carious lesions, and therefore cat "cavities" is an incorrect term. It has been determined the lesions typically begin in the cervical area of the teeth and the resorption may extend into the root, the crown or in both directions. "Cervical line lesion" is not considered an accurate term. 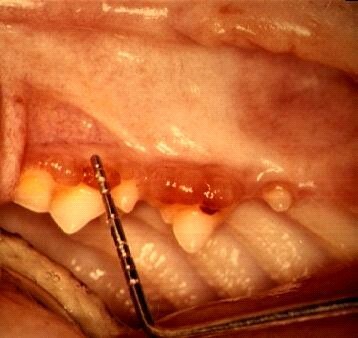 Feline odontoclastic resorptive lesion (FORL) is a term that has had widespread use, however, feline tooth resorption is currently considered the best term to describe these lesions. What is the cause of tooth resorption? The exact cause of tooth resorption has not been definitively established. It has been our experience that cats who have had tooth resorption diagnosed, will very likely develop additional lesions in the future. For this reason, dental radiographs are essential to monitor these cats to allow for early diagnosis and prevention or elimination of pain. 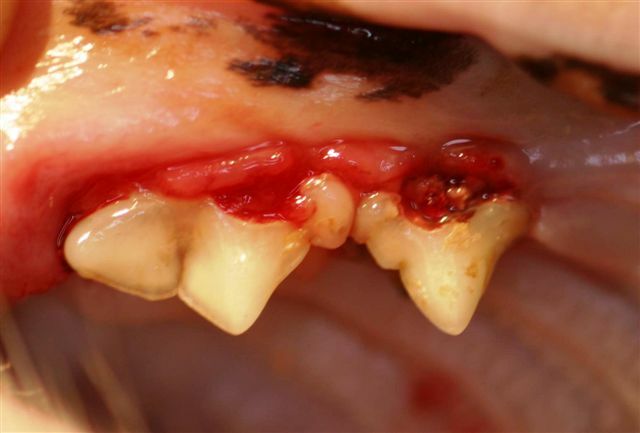 How can we prevent tooth resorption in cats? An exact cause or set of circumstances that result in tooth resorption has not been established. It is therefore not possible to effectively prevent tooth resorption. Early recognition by performing thorough oral exams with intraoral probing and dental radiography is the best strategy to help these cats. What are the signs or symptoms of tooth resorption? Cats are very careful not to demonstrate pain. Signs of pain can be very subtle with these cats. You might notice more calculus (tartar) in specific areas, gingival inflammation (possibly the only sign), increased salivation or changes in food preferences. Owners typically fail to realize their cat is painful until after they experience behavioral changes (happier and more playful cats) subsequent to treatment for these resorbing teeth. It is helpful to brush your cat's teeth daily, or three times weekly at a minimum. This is your opportunity to observe your cat's oral health. Watch for the gingiva growing onto or into the tooth resorption defects. Look for excess salivation, oral bleeding (look for blood around the food and water bowls), gingival inflammation and difficult or reduced eating. 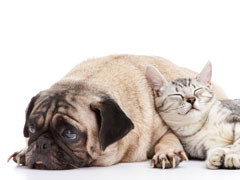 Food preferences from hard kibble foods, for soft foods may be a sign of oral discomfort. When brushing the teeth, look for excess accumulation of hard firm calculus (tartar). These accumulations suggest the cat is not chewing (because of pain) on the side with greater calculus accumulation. Missing or fractured teeth are other potential signs of tooth resorption. Some cats with tooth resorption also have generalized oral inflammation, or stomatitis. Tooth resorption has been classified based on the extent and location of the resorption. (TR4c) Root is more severely affected than the crown. What is the treatment for tooth resorption? The best treatment for tooth resorption is dental extraction. Unfortunately, this is easier stated, than performed. These teeth are fragile and usually fracture during extraction. Dental radiographs are essential for extracting these teeth because they help the operator find fractured root fragments. The entire tooth should be removed to avoid infection or other problems. Many cats with feline stomatitis have tooth resorption. In treating these cats, it is essential to remove the entire tooth structure to help eliminate the tremendous immune stimulation, and inflammation that typically is present.